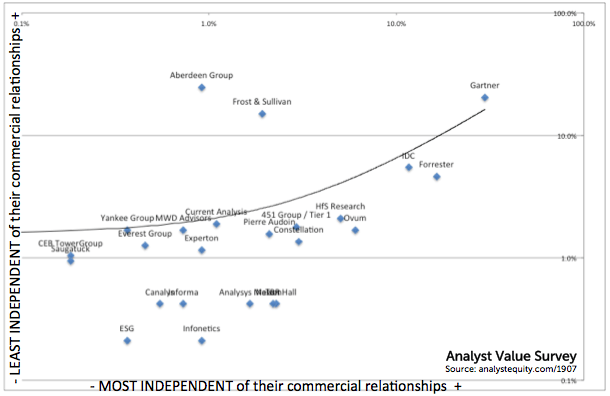 Users of analyst research have really different perceptions of how independent some analyst firms are. People seem to be fairly certain that Aberdeen Group has less independence than Ovum, but there very mixed opinions about Gartner. On the right is one of the charts we’ve prepared to discuss the results of our annual Analyst Value Survey. Around 200 users of analyst research answered a pile of questions, including ones about which firms’ research they felt was the most, or the least, independent from the analysts’ commercial interests. Most respondents named the same half dozen firms when asked to think of those firms which are, or are not independent. The further right on the chart a firm is, the greater the number of people who said it was independent. And the higher up it is, the greater the number of people that said the firm was less independent. What’s notable here is the trend line: that that’s a positive correlation between the two. Generally speaking, the more people think an analyst firm is independent, the more other people think it is not. Whether a firm is large or small, its users will always have divided opinions and experiences. The good news is that more people think of the firms as being independent, and many of them are tightly clustered. On the chart, we’ve used logarithmic scales on the axes to show that more clearly and to space the labels out more. But the bad news is pretty clear: many analyst firms are doing a really bad job of communicating their independence, and a number of the expert users who responded to the survey are really sceptical. To find out more, visit AnalystValueSurvey.com to get your copy of the report. ← Survey: which analyst firms are moving up (or down)? So Gartner is the most independent and the least independent? Exactly. Respondents have stronger opinions about Gartner than any other firm. Some say Gartner’s very independent, and others disagree. Hi Evan. Who is this “you” that your comment is addressed to? This chart averages the scores given by around 180 non-analyst users of analyst research. Not all of them commented on ESG, and those who did almost certainly know your firm better than I do personally. This is quite unlike an MQ, which is a series of qualitative judgements by the researchers. In this case, there’s no judgement involved in the placement of the data. It’s just the averages of the scores from the participants. It might be that hundreds of people who took the survey don’t know ESG well, but I can’t really ask that all of them interact with every firm before they take the survey. That would be impractical.